McDowell looks on as Toms birdies the 18th to force sudden-death.Graeme McDowell is a confidence player. When he’s up, he’s sky high. When he’s down, he’ll try and convince himself he’s sky high. This time, he couldn’t hide the truth. It was written all over his scorecard - a 79 in the final round of the Players Championship at Sawgrass. From hero to zero as they say. Or in this case, from third round leader to 33rd. He wasn’t the saddest man on the property at the end of a long, long day - that was David Toms, who three-putted at the first extra hole to hand the title to KJ Choi, missing a three and half footer for par on the 17th green just minutes after holing from 17 feet for birdie on the 18th to force a play-off after they had shot 70 to tie on 13 under par. McDowell led by a shot from the eventual protagonists after 54 holes when he completed his delayed third round in 68 to top the leaderboard on 12 under par. It could have been a three-stroke lead had he not seen his approach to the 18th from the right rough, kick bizarrely through the green and into the water for what proved to be an extremely costly double bogey. Was that the turning point? In hindsight it certainly put McDowell under far more pressure early on and that proved to be his undoing as he took his “new” swing into the heat of battle for the first time after a six-week period filled by missed cuts, frustration and technical blind alleys. Either the running repairs he made to his swing with coach Pete Cowen last weekend failed to stand up under pressure or his head simply couldn’t handle another dogfight after eight months of battle scars. Either way he finished up eight shots outside the play-off between 40-year old Choi and 42-year old Toms on five under par. Despite holing a 50 footer for birdie at the fifth to get to 13 under, McDowell dropped five shots in his next ten holes after a series of erratic swings and when all was lost he double bogeyed the 17th and bogeyed the 18th after visits to water. They key was a push-slice into the trees at the sixth which sowed the seeds of doubt. He followed that by hooking into the water at the seventh and then hooking into a bush with an over ambitious lash at the par-five ninth. Electing not to take a penalty drop, he could only move the ball a few feet and bogeyed there to go into the back nine three behind Toms. But by that stage he was cooked physically and emotionally and kissed the title goodbye when he four water left of the par three 13th. Considering that he was at sea with his game after three missed cuts in his last four starts, McDowell made progress this week. He sorted out some technical issues with Cowen but once he lost his focus and his confidence, he never looked like recovering. Set to play in the Volvo World Match Play in Spain this week followed by the BMW PGA at Wentworth and his defence of the Saab Wales Open before heading to Congressional at US Open champion, he confessed: “I said I was going to take the positives away whatever happened this weekend. I said I was going to stick to my guns. It’s going to hurt for a few hours, but it was a tough task today. The golf course and the wind got up. It was tricky, and I just didn’t have it. Asked how he could put a positive spin on such disappointment, he said: “Try to respond positively. I’m jumping on a flight to go to Spain tonight, and I’m taking a good game with me. “Like I say, it was disappointing out there today. Probably my first time under the gun in a little while. So first time we played in front of a crowd that big in a little while, you know. So it’s kind of getting back into the old vibes again. Choi (70) was one behind Toms (70) with three to play but drew level with a par at the 16th as Toms found water with his approach from 233 yards. It was a bold shot by the 2001 US PGA champion, who’s greatest claim to fame was laying up on the 72nd hole at Atlanta Athletic Club a decade ago before getting up and down to beat Phil Mickelson was a stroke. Who knows what might have happened had he laid up again. 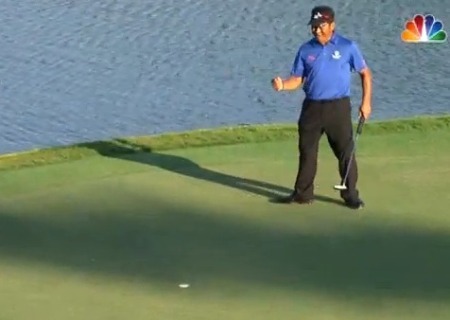 A bogey on a birdie hole gave Choi hope and he walked away a winner. Without a win since 2008, the Korean went to the last one clear when he birdied the 17th. But Toms forced a play-off with brilliant approach from a divot to 17 feet and an even better birdie putt. In the play-off, it all came down to putting. Choi, who turns 41 next Thursday, won by two-putting for par from 40 feet. Toms three-putted from 18 feet - racing his birdie put three and and a half feet past and then missing the return. Graeme McDowell is praying he can avoid becoming part of the 17th hole bloodbath at TPC Sawgrass. The Ulsterman will tee it up in The Players for just the second time, hoping to maintain his 100 percent “dry” record on the terrifying, 137-yard par-three. Padraig Harrington hits his tee shot on the 17th at Sawgrass.Padraig Harrington battled through the pain barrier after an injury to his dodgy right knee threatened to derail his challenge for The Players at Sawgrass. The 39-year old Dubliner, who went under the knife to remove damaged cartilage in his right knee almost 12 months ago, complained in practice of a “stabbing pain” during his takeaway and will have treatment before his second round today. Harrington hit just four fairways and was forced to rely on his putting as he opened with a one over par 73 to trail leader Nick Watney by nine shots as Graeme McDowell regained some form with an encouraging 67. The US Open champion - who birdied the first, chipped in at the third and then birdied the fifth late on Saturday evening to finish a day of rainstorms tied for the lead with American talent Nick Watney on 11 under - parred his way to the turn early on Sunday as Watney birdied the eighth to get to 12 under.